This patent centers on the ability to filter audio and video streams based on processing real-time user interaction via gestures for the purpose of remixing in live television or online video programs; and for providing moderation and screening services in conjunction with the gesture driven filtering. A method of operation of a composite broadcast system includes: receiving a client AV stream from a user station and a user profile associated with the client AV stream receiving a user interaction from the user station approving the client AV stream for airing based on the user interaction and the user profile receiving a program AV stream generating a visualization based on the user interaction and the user profile and mixing the client AV stream, the program AV stream, and the visualization for broadcasting to multiple devices. 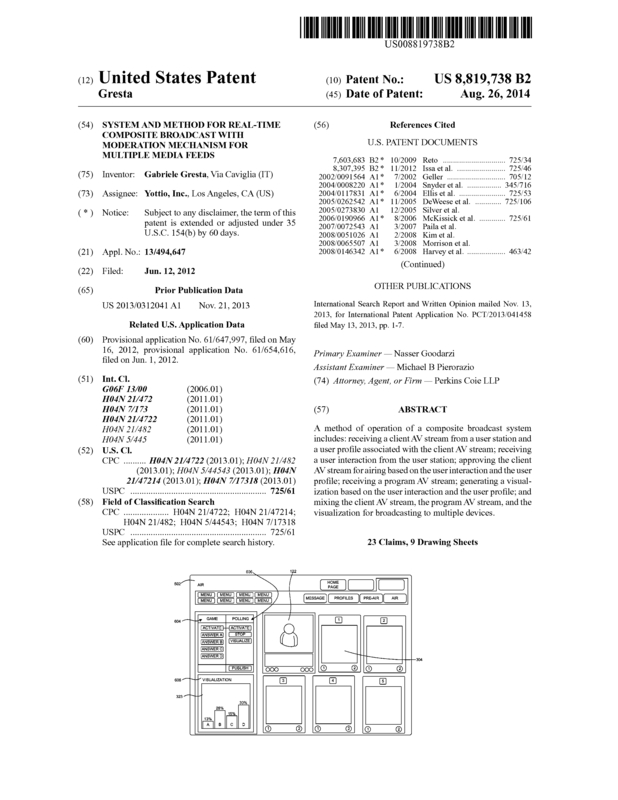 Page created at 2019-04-24 18:04:50, Patent Auction Time.